i bought two of these for my boys rooms. it looks great and it wears beautifully. it washes very nicely. we really enjoy it. I would recommend to anyone. This three-piece quilt set from Harbor brings the comfort and quality you desire to your home. 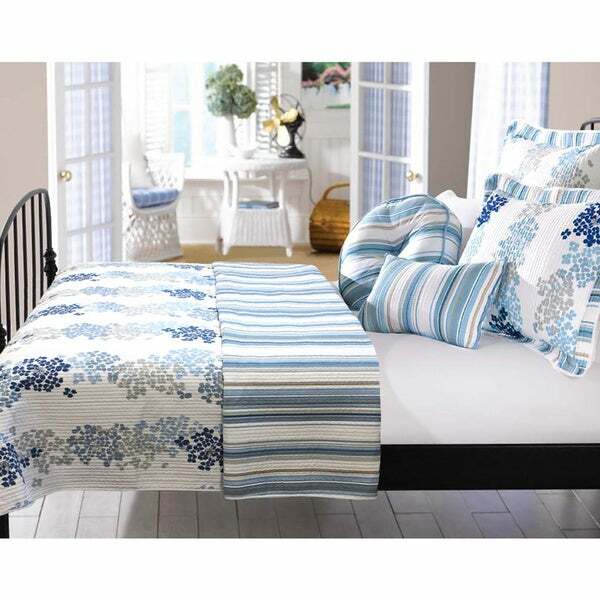 This floral quilt set offers a coordinated stripe print on the reverse side for added style while folding over. Made from 100 percent polyester microfiber, this quilt set is machine washable and easy to care for. We live in Arizona so I was looking for a very light weight quilt and that is what I got. We are using this quilt flower side up and I really love it. The colors are great and the cost was so reasonable that it negated any worries I had about the white on the quilt. I would recommend. I first found the pillow shams like this set in a local outlet type store and the print and colors were just what I wanted so I bought them. However, I couldn't find the comforter. I was excited to see that Overstock had the comforter set. I am keeping the set because the colors are perfect for me but I was disappointed because it's made from a polyester fabric whereas the shams I found earlier at the store were made from cotton. I like the overall feel of the cotton better. (I used my cotton pillow shams to make additional throw pillows for my bedroom.) It's not the best quality but it was still the best match and look for my room. Great for queen bed size - might be a little long for traditional full size bed. Looked endlessly for the best quilt for the right price and this worked. I really love this quilt in our room. Very happy with this purchase! I prefer my comforter not be 'puffy' and this certainly meets my expectations! Love the reversibility of the comforter. Love the colors! The pillow shams are perfectly sized and well made! I had been looking for a new quilt for my bedroom and this is just perfect! I wouldn't really say it's a quilt though, more of a coverlet, which is great for this time of year. It's very summery and the blues go great with my walls, it just brightens up the whole room. Very happy with this purchase. I ordered this quilt to go in a room that has dark blue carpet, so the colors were extremely important. The photo made it look like the darker color was a dark Royal/bright navy blue; however, the quilt itself was more of a deep aqua and didn't go in my room at all. I didn't think it was as pretty in person as it is online, but that's just my opinion. Great quality for the price. Very soft, colors as pictured and fits well with the current decor. Recommend this purchase, nothing fancy but quite nice. This quilt has stood test of time. I waited to rate this until I used it for a period of time. It has been dirable and colors stay bright over time. Definitely worth the cost. Looks exactly as pictured, light weight. Ordered this as a back-up because I have been having trouble finding exactly what I want for my blue bedroom. This quilt does look very pretty and summery on our bed for spring and summer. I really like this bedspread. Just right for summer. Well made. It is on the lighter side, but it was exactly was I was looking for. I love it!! The picture shows exactly how it is. If you have a queen bed and you want it to hang longer on the sides, I would order a King. "Looking to get the throw pillows for this set. Where can I get them?" Unfortunately the matching pillows are not available. "I am more interested in the reversed side with stripes. Are the stripes on the entire side or just a small portion where it would show when you fold it over?" The stripe print is on the whole reverse. Looking for a light-weight "winter" quilt for our blue bedroom. "Hello, do you sell the decorative pillows separately?" Hello lizvette0624, unfortunately the pillows are not sold seperately within our current inventory. Please let us know if you have additional questions. Thanks for shopping with us. "do you sell the throw pillows to match?" Hello kellykeys, we do not currently have matching throw pillows on our site. We get new inventory daily, so please check back soon. Thanks for shopping with us! "Is this offered in King size? What is the company who makes this quilt so I can search for it in the King size? Thank you." Hello thrifyfifty, we are unable to disclose the manufacturer of some of our products. Unfortunately, we have not had this quilt in a King size. Thank you for shopping with us.